There are many forms of arthritis but the most common affects the elderly and is called osteoarthritis. This condition affects us as we age and can result in painful joints, especially the weight bearing joints of the hips and knees. Atlas Pain Relief Centre in Tamworth can help people who suffer with arthritic symptoms. Arthritis describes the degeneration of articular cartilage which glaze and protects the bone ends where 2 bones meet to form a joint. This cartilage protects the bones and when the cartilage breaks up, blisters and cracks, then the underlying bone can be exposed leading to painful joints. This is similar to the enamel on your teeth wearing out and decay of the tooth which ultimately exposes the nerve and results in toothache. Arthritic pain can be troublesome and restrict movement at the joints and in severe cases stops people from walking and interferes with their daily living activities. Often you are told by GP’s there is nothing that can be done and to continue taking medication but Tamworth Osteopaths at Atlas Pain Relief Centre can often help. We have acupuncture also which is often successful at treating the arthritic pain symptoms. Other forms of arthritis include Rheumatoid arthritis (RA) which is a chronic systemic disease causing inflammation in more than one joint. 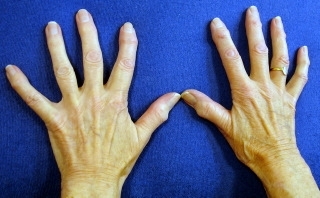 RA is a disease of the synovium and is very painful with the cause of this condition unknown. Other conditions to affect the joints can be placed under the heading of Spondylarthropathies These include Ankylosing Spondylitis, Psoriatic Arthritis, Reiters and Reactive Arthritis. These conditions have an inflammatory nature and are treated with anti inflammatory medication normally. Arthritis is not confined to the elderly but the majority of cases are from this group because of the aging process. Glucosamine Sulphate is a product widely recommended for arthritic patients as it as be found to help nourish articular cartilage. It should be taken ideally as a prevention rather than a cure, however use of this supplement has been promoted by many people including Gp’s and nutritionalists. 1500 mg is a suitable daily dose to take in tablet form but this can be found in liquid form also. Atlas Pain Relief Centre has a lot of experience treating the elderly and helping them cope better with arthritic pain. There are products for sale which help reduce the discomfort such as Biofreeze Gel. Acupuncture, Osteopathy and Physiotherapy will also maintain mobility in the joints and can be used for pain relief and strengthening of muscles.